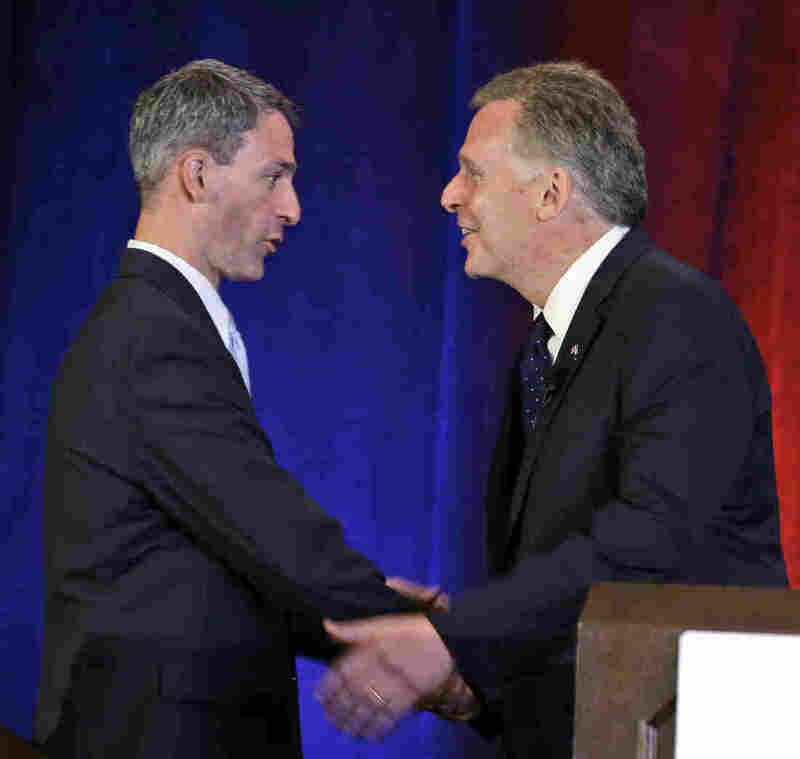 Virginia Governor's Race: Negative And Getting More So : It's All Politics If you like your gubernatorial campaigns negative and nasty, then Virginia's governor's race is for you, and will likely remain so until Election Day in November. How could it not be with such good raw material for attack ads? The increasingly negative campaign that is the Virginia race for governor between Republican Ken Cuccinelli (left) and Democrat Terry McAuliffe could keep some voters home. If you like your gubernatorial campaigns negative and nasty, then Virginia's race for governor is for you, and will likely remain so until Election Day in November. How could it not be with such good raw material for attack ads? The Republican standard-bearer is controversial Attorney General Ken Cuccinelli, who has acknowledged receiving vacations and other gifts valued at $18,000 from the same businessman who plied GOP Gov. Robert McDonnell and his family with money and gifts valued at more than $145,000. Meanwhile, the Democratic nominee is Terry McAuliffe, whose background as a friend of the Clintons, a wheeling-dealing entrepreneur, a top political fundraiser and former Democratic National Committee chairman makes him an opposition researcher's dream. So Cuccinelli is being pummeled by a steady stream of criticism from the McAuliffe campaign and others for not repaying the businessman's gifts, like the governor has. McAuliffe ads attacked Cuccinelli for, among other things, allegedly helping the energy industry at the expense of ordinary Virginians. Democrats were always going to target Cuccinelli for his ideology, which is considerably to the right of many Virginians in a state that has gone from red to purple. But for Democrats, the gifts opened up another potentially potent line of attack, especially since Cuccinelli has so far indicated he has no intention to repay them. Cuccinelli's campaign, for its part, is flogging reports that an electric car company McAuliffe helped create is being investigated by federal officials for allegedly misusing a visa program. The Republican's campaign was helped at the start of the week from the Republican Governors Association, whose chairman, Gov. Bobby Jindal of Louisiana, introduced a new TV ad that essentially called McAuliffe a liar, and highlighted ties between GreenTech Automotive and a Chinese company linked to that nation's intelligence apparatus. And that was on top of the 30-minute, anti-McAuliffe documentary by Citizens United, the same group whose lawsuit resulted in the Supreme Court lifting limits on campaign spending called independent expenditures that corporations and unions can make. For self-evident reasons, negative campaigns like Virginia's tend to make many voters decide to do anything but vote come Election Day. Turnout in the Virginia governor's race was likely to be challenged anyway by the November election occurring during an off-year. Since Republican candidates tend to have a relatively easier time getting their voters to the polls than Democrats during off-year elections, all the negativity in Virginia could wind up harming McAuliffe more than Cuccinelli. If the race will be as close as recent polls suggest, turnout will be critical. Unfortunately for any Virginian already fatigued by the increasingly negative contest for governor, it's only August.